instruments to electrically analyze the rebuilt alternator while it is being driven on the stand. We can simulate excessive loads, vary the speed of the alternator and test for amperage output and voltage regulation set point. 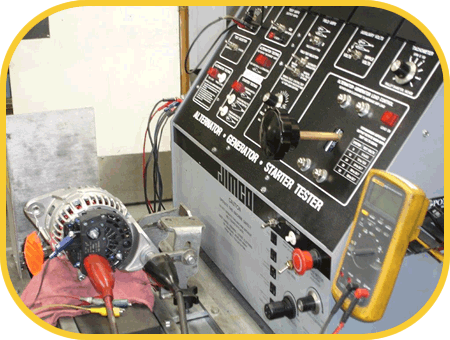 At Alpine Auto Electric we use an oscilliscope in our final testing for all rebuilt starters, generators and alternators. Our oscilliscope works very similar to one that monitors a patients heart in an hospital. The "scope" looks at the electrical patterns while the testing unit runs to make sure that there are no internal shorts or leakage. Rebuilt starter motors are tested for amperage draw. 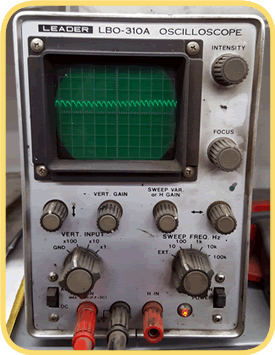 During starter testing, the oscilloscope is used to look for any possible solenoid, armature or field coil defects.